Place eggs in a pan cover with cold water and bring to a boil. Cover pan and turn off heat. Let sit for 8 minutes. Fill pan with cold water to stop cooking. Peel eggs, roughly chop and place in a bowl. Add mayonnaise, mustard, chives, salt and pepper. Gently mix. If mixture is too dry, slowly add a little more mayonnaise. 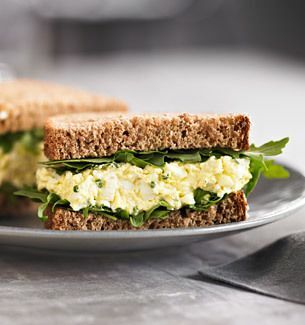 Garnish bread with arugula and place half the mixture on each sandwich.